Сначала я собиралась продублировать то же самое по-русски, но потом передумала. В конце концов, Duolingo пока не поддерживает русский язык, поэтому мой обзор будет бесполезен для тех, кто не читает по-английски. At first I was going to write this both in English and in Russian, but then I thought that English would be enough. 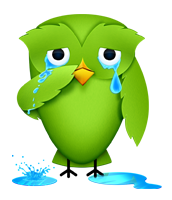 After all, Duolingo does not support Russian, so my review would not be of any use to those who don't read in English. Today I finished my last French lesson on Duolingo and I want to share my experience. So, my first thanks to Duolingo team is for the neat and bright design that inspired me! I've never missed a day in all my 3 months. So simple, but so effective motivation. If you choose doing exercises, you have to pass a session of about 20 tasks. You translate phrases and sentences from French into English and vice versa, you choose the right answers for multiple-choice questions and type what the “ladybot” (as we duolingers use to say) says. There is also an option to record your voice, but I turned it off at once. You can make up to 3 mistakes in the entire session—otherwise, you'll have to start all over again! For a successful session you get from 10 to 13 coins depending on your mistakes. For a full stack you have to earn at least 91 coins a day! That is tough. But as it becomes harder and harder with your progress down the tree, you should remember about “real world” translations. You can get 6 coins for the translation of a simple header or up to 15 coins for a long sentence! What's even better, your translation does not have to be an exact match to some pre-existing version. So if I was too busy to get through the lessons, I made some translations. Anyway, I kept my coin stacks full! As the time passed, I developed some workarounds. If I failed the first task, I just refreshed the page and started all over again. I also came to writing out sentences with their translations. I mean, literally writing them in a copybook with a pen! This helped a lot because my memory works extremely well when I write something. In fact, I did not have to peek into my records very often. Duolingo was not my only resource for learning French. I added Michel Thomas's audiocourse, joined busuu.com, began to read books and chat with people. I made a Google spreadsheet for my own vocabulary. 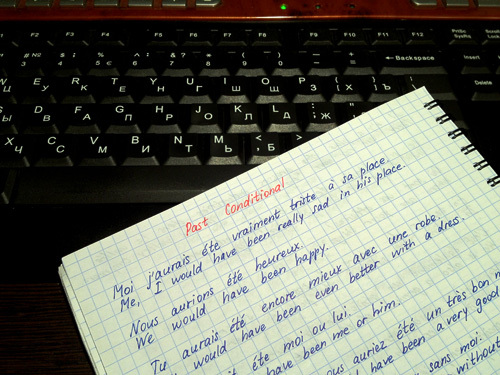 I read grammar explanations on irgol.ru. In fact, it is hard to define the exact role of Duolingo among all these resources. It does not teach you writing or speaking as you have always to translate some ready sentences and texts. It does not explain grammar. But it gives a good start. The strong point of Duolingo is repetition. If you earn coins mostly by doing lessons and refresh sessions, it is easy to retain the new words in memory. The same is with grammar. The same patterns are given again and again, so you get to remember them well at last. Again, thanks Duo for great algorithms of repetition! 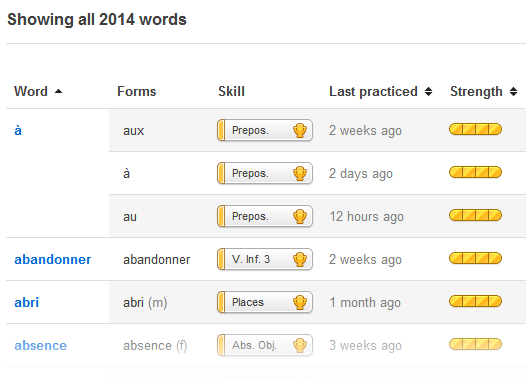 There are 2014 words listed in my Duolingo vocabulary. That's a nice start. Another advantage of Duolingo applies to non-native English speakers like me :) The universal community language is English, so you have to use it a lot for questions, explanations, insights and so on. And of course English is the language for translations. I had to remember some English grammar aspects while doing the exercises and translating. Now I'd like to outline some weak points. The new words and sentences appear without any introduction. You can hover the word and see a popup with translation options, but that does not always help with complex sentences. You can type exactly what is in the popup and have your answer rejected as wrong. You can get an expression that is hard to guess. Finally, I became used to the fact that I don't pass a lesson at my first attempt. The unit topics are not always good. I totally liked the last units devoted to different pieces of grammar. I liked also the units on some topic like sports, clothes or food. But those enormous units on adverbs and prepositions were just awful! It is very hard and ineffective to learn so many adverbs in a row. The unit sizes vary a lot. I realized that the best amount for me is about 100-150 points for a unit, that is, 4 or 5 lessons in it. It is perfect not to get too bored with one topic. The fact is, the refresh only begins when you get through all the lessons. You can use the Practice button, but you never know what topic you'll get. You can use the Vocabulary section, but you don't get points for specific lesson with it. So you have for example 15 lessons of Abstract Objects that you have to do first. And then you have to do about the same amount of refreshes. This is very tiring. It would be much better to have all this in smaller parts like 4 lessons, some practice, 4 more lessons, some practice and so on.